Watertree Press is pleased to announce our second release entitled Fighting for Peace: Combating Conflict with Character by Dr. Dennis D. Morgan. This is a well-researched and thought-provoking book which fulfills Watertree's motto: Read. Think. Grow. Conflict in relationships is a fact of life. When people are around each other there is not only the potential for conflict, but there is going to be conflict in some form, to some extent, at some time. Rather than fearing conflict, Dr. Dennis Morgan encourages readers to see conflict as an invitation from God to strengthen relational closeness. Fighting for Peace will challenge you to consider your personal relationship with God, to more fully know and examine yourself, and to move toward others in humility - combating conflict with character. "Conflict. It's all around us. In our world...our nation...our homes. The need for resolution is imminent. In his book, Fighting for Peace, Dr. Morgan presents us with a fresh and new virtue-based positive paradigm for conflict resolution." "We Christians speak of the gospel as life giving, but often we struggle to bring the good news of Christ into our day-to-day living. This book will help. Dennis Morgan weaves together his extensive experience as a psychologist, love for theology, and practical wisdom into this readable invitation to godly humility." "Many counseling books today feature stories of how "John and Sally" came for help, provide a few features of their tortuous life, and end with-usually-an account of transformation. A different pathway has been chosen in this book, and-in my own view-a better one. Writing with the experience of someone who works on the sharp edge of personal counseling, Dr Morgan's thinking is anchored in vital biblical teaching, patiently expounded from Scripture, and then carefully drawn out in application. These pages will be read with care and gratitude, for they hold out the promise of help for all those who give counsel as well as for those who need it." Dr. Dennis Morgan (M.A. and Psy.D. Clinical Psychology, Rosemead School of Psychology) is a faculty member in the Graduate School of Columbia International University. He is also a Licensed Clinical Psychologist in South Carolina and is in private practice with the Christian Counseling Center of First Presbyterian Church, Columbia, SC. He has over 25 years of experience in clinical practice in California, Texas, Tennessee, Virginia, and South Carolina. Dr. Morgan has a special interest in assisting clients' spiritual formation in the context of clinical practice. This has been a focus for his writing and research. Dr. Morgan and his wife, along with their two children, are also on the short-term missionary staff of Mission to the World, making member care and counseling related trips to Europe annually.. 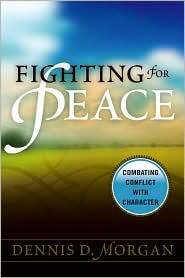 If you're a church, school, bookstore, or other organization interested in purchasing Fighting for Peace in quantity, please contact us.